Pablo Picasso’s blue period portrait La Gommeuse has achieved a record $67.5 million at Sotheby’s in New York, as part of their Impressionist & Modern Art sale on November 5. Van Gogh’s atmospheric landscape, Paysage sous un ciel mouvemente, sold for $54 million, helping to take the evening’s total to $306.7 million. 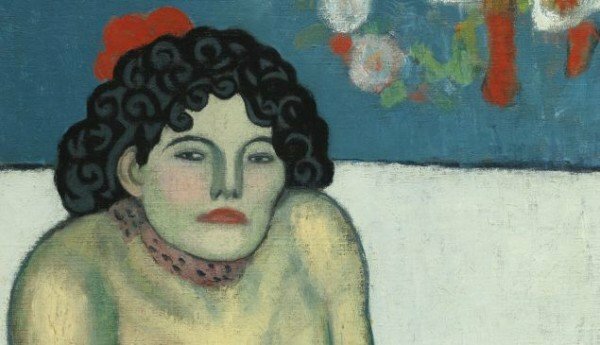 La Gommeuse, described as most the important blue period Picasso to come to the market in a generation, was painted in 1901. It features a second portrait on the reverse of the canvas, which was hidden for a century until its discovery in 2000 during conservation work. The caricature of Pablo Picasso’s friend Pere Manach was apparently intended as a gift for the Catalan anarchist who shared the artist’s studio flat in the Boulevard de Clichy in Paris. The painting was one of 47 works on offer, with just over three-quarters finding buyers. At least two of the top 10 lots were bought by Asian private collectors, continuing a trend of recent seasons. The $306.7 million total comfortably beat the $275 million low pre-sale estimate. Sotheby’s had tagged the high estimate at about $370 million. This total brings Sotheby’s sales of Impressionist & Modern Art in just the past 24 hours to $575.8 million.